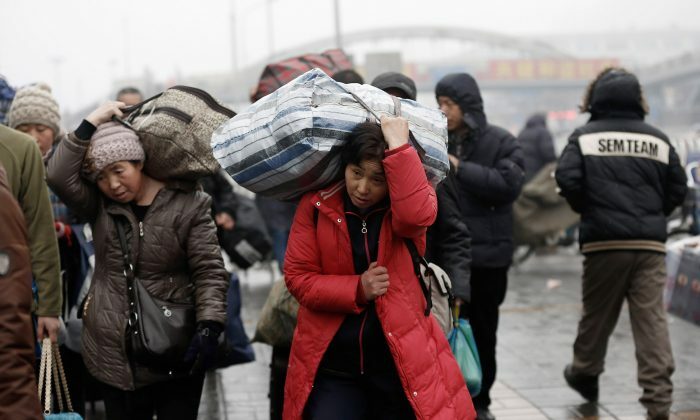 Millions of Chinese citizens will be given a kind of grudging reprieve from the disabling lack of legal status they have suffered under the “hukou” or household registration system. The current household registration system will be replaced, according to a plan announced on Feb. 15 by the Ministry of Public Security. The temporary residence permits granted migrant workers will be scrapped in favor of permanent resident permits, which will allow immigrants from outside a particular city to receive benefits on a pro-rated basis. The longer an immigrant has lived in the city, the more social services the immigrant would be entitled to. The resident permit itself is illegal. The household registration system has ancient antecedents in China, and the Chinese Communist Party revived its version of the institution in 1958. With a huge and very poor rural population, the registration system enabled the regime to limit migration to the relatively more prosperous cities. The result has often been criticized as a caste system, with the rural population frozen in place with less opportunity and wealth. Nonetheless, the rural residents have migrated in large numbers to the cities, often illegally, and have been treated as second-class citizens. Social services are not available to them. They cannot buy a car or an apartment because they are “non-residents” of the cities that they are working in. Their children are often left behind to be taken care of by grandparents in the towns they are born. The children are not eligible to attend school and, when the time comes to apply for college, as “non-residents” they are not allowed to participate in the local college entrance examinations. Migrant workers are also often singled out for police mistreatment. A notorious case involved a worked named Sun Zhigang. In 2003 in Guangzhou in southern China he was beaten to death when police discovered he hadn’t applied for a temporary permit. When the reform will be enacted is not clear. The regime mouthpiece Xinhua hailed the planned reform, calling the canceling of the temporary permits “the best New Year’s gift ever,” on Feb. 16. “The resident permit itself is illegal,” said Chinese lawyer Cheng Hai in an interview with Deutsche Welle. “The State Council basically is handing out a certificate to set limits on where people can live, and it is without the approval of the National People’s Congress.” The National People’s Congress is the Chinese Communist Party’s fake legislature. The Ministry of Public Security is an agency within the State Council. “What’s more, anyone coming to work in Beijing, is a taxpayer, for he has contributed to the government’s income. So, he should be entitled to the rights like a normal citizen,” said Cheng. “The household registration system should only reflect the identify of a citizen, and it shouldn’t be tied to any interest or social benefit,” said Cheng. Wang Shichuan, a columnist for the Chinese news portal Sohu, asked not to read too much into the significance of scrapping the temporary residence permit, for the residence permit still exists. Tiananmen Square was especially noisy this Oct. 1 as petitioners from provinces across China gathered to make their grievances known to the authorities. In southern China’s Shenzhen City officials suspended construction of over 2000 properties due to the developer’s financial crisis. House owners protested, asking that their investments be protected.